Warner Bros. is proceeding carefully with their plans for a shared cinematic universe based around their DC Comics properties (a lot of which rides on next March’s release of Batman v Superman: Dawn of Justice) to compete with the unassailable Marvel Studios. They had originally planned a sequel to 2013’s Superman reboot Man of Steel to kick off the summer of 2018, but the tentatively-titled Man of Steel 2 was taken off the roster as James Wan’s Aquaman moved into position as Warner/DC’s big 2018 summer tentpole release. Meanwhile, a solo Batman reboot starring Ben Affleck has been dated for November of that year. Unlike Marvel Studios’ blockbuster line-ups, which are usually set in stone but remain subject to the occasional alteration, the DC Comics Shared Cinematic Universe release schedule appears to be in constant flux. Even though Man of Steel 2 is not in active development at Warner Bros. for the moment, that can always change, and fast. Jon Schnepp, the director of the fantastic recent documentary The Death of Superman Lives: What Happened?, was interviewed for the latest episode of Popcorn Talk, and during his talk he dropped an interesting little nugget of an unconfirmed rumor that none other than George Miller, fresh from the recent worldwide critical and commercial success of Mad Max: Fury Road, was in talks with Warner Bros. to assume directorial duties on Man of Steel 2. You can check out the entire new episode of Popcorn Talk here below. Schnepp’s comments regarding Miller begin at 55:30. 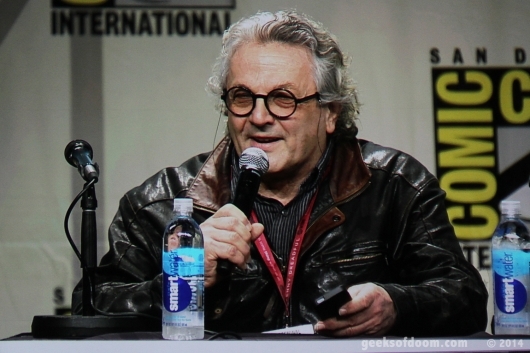 If this rumor turns out to be true, it wouldn’t be the first time that George Miller has been linked with a film based on a DC Comics property. In 2007, Miller was gearing up to direct Justice League: Mortal for Warner Bros. with a cast that included D.J. Cotrona (G.I. Joe: Retaliation) as Superman, Armie Hammer (The Social Network) as Batman, Common (Selma) as John Stewart/Green Lantern, and his Fury Road villain Hugh Keays-Byrne as J’onn J’onzz, the Martian Manhunter. The $200 million project was slated for a summer 2009 release, but was later shelved indefinitely in favor of developing solo features based around the more famous members of the League. They also didn’t want to have another silver screen Batman while Christian Bale was still playing the character in Christopher Nolan’s trilogy. Would I want to see George Miller make a Superman movie? Darn skippy I would. So would you and you know it. Miller is a filmmaking legend just for his Mad Max series and he has the perfect visual and narrative sensibilities to do DC’s Last Son of Krypton justice on the big screen. He would definitely be a better choice to make a great Superman movie than Man of Steel‘s director Zack Snyder (currently a little busy as the unofficial overlord over all DC-related film properties at Warner Bros.), in my humble opinion. Plus, since he hopes to make a few more Mad Max sequels in the future (the next one, Mad Max: The Wasteland, is already in development), having one a DC Comics franchise blockbuster under his belt would almost guarantee Miller the creative and financial freedom he requires to continue making films his way until the day he decides to pack it all in. I hope Schnepp’s source for this rumor is right on the money. George Miller understands the power of myth. He knows what really makes a hero in this cynical, media-saturated age. He would make the best Superman movie since Richard Donner first brought the character to the screen on a scale never before imagined in 1978. If there is truth to this rumor, then we could possibly be looking at yet another change in Warners’ release strategy for their DC Comics movies. The fact that the studio is courting a director for the Man of Steel sequel that had previously been pushed back to sometime early in the next decade must mean that they are losing confidence in one or more of their other planned superhero movies and would rather have another sure thing in play instead of fully committing to an Aquaman or Cyborg feature. This could all change depending on the reaction by fans and audiences to Dawn of Justice next March. For George Miller, either Man of Steel 2 becomes his next project or we’ll be seeing Mad Max wander the wasteland again in just a few short years. We’ll know the truth soon….hopefully.